Another knock against fruit juices: Many contain potentially harmful levels of arsenic, cadmium and lead, according to Consumer Reports. The non-profit consumer research and advocacy group tested 45 fruit juices (apple, grape, pear and fruit blends) sold across the U.S. and found elevated levels of those heavy metals in nearly half of them. Particularly concerning to the researchers was that many of the juices were marketed to children. Consumer Reports tested 45 drinks and found 21 contained enough of a single heavy metal or a combination of the metals to concern experts who worked with Consumer Reports on the study. Drinking just 4 ounces a day can cause concern, said Consumer Reports chief science officer James Dickerson. Drinking lots of fruit juice could compound their risk, the researchers say, because children may also encounter elevated levels of heavy metals in baby foods, rice products, and other foods, as well as from water and the environment. The drinks tested were from 24 national, store, and private-label brands including Capri Sun, Gerber, Minute Maid, Mott’s and Welch’s. Researchers bought three samples of each product from retailers across the country. •Each of the 45 products had measurable levels of at least cadmium, inorganic arsenic, lead, or mercury. •Twenty-one of the juices had concerning levels of cadmium, arsenic, and/or lead. •Seven of those 21 juices had levels that could harm children who drink 4 ounces or more daily; nine posed risks to kids at 8 ounces, or 1 cup, or more daily. •Five of the potentially harmful drinks were juice boxes or pouches containing 4 to 6.75 ounces. •Grape juice and juice blends had the highest average levels of heavy metal. •Juice brands marketed to children did not fare better or worse than other juices. •Organic juices did not have lower levels of heavy metals than conventional ones. The seven juices that Consumer Reports found could harm children who drink 4 ounces or more daily were: Trader Joe’s Fresh Pressed Apple Juice, 100% Juice; 365 Everyday Value (Whole Foods) Organic 100% Juice, Concord Grape; R.W. Knudsen Organic Just Concord Grape Juice; Welch’s 100% Grape Juice, Concord Grape; Welch’s 100% Grape Juice, With Grape; Great Value (Walmart) 100% Juice, Cranberry Grape; Welch’s 100% Juice with Antioxidant Superberry. The U.S. Food and Drug Administration has a guideline for lead in juice of 50 parts per billion (ppb), but the CR researchers think that should be lower. That’s because more than half of the drinks tested 1 ppb or less. Only Welch’s 100% Juice With Antioxidant Superberry and Welch’s 100% Grape Juice, Concord Grape were found to have an average of more than 5 ppb. The FDA has not set a guideline on inorganic arsenic, but five years ago proposed limiting it to 10 ppb in apple juice, the equivalent to the standard for drinking water. Only one juice, Trader Joe’s Fresh Pressed Apple Juice, had inorganic arsenic levels above the FDA’s proposed guideline – and 58 percent of the juices had levels below CR’s recommended cutoff of 3 ppb. The FDA has not proposed a limit on cadmium for juice. However, three juices had cadmium levels above CR’s recommendation of 1 ppb higher than that amount. This is just the latest health flag raided about fruit juice and children. Two years ago, the American Academy of Pediatrics said children should not drink fruit juices in their first year, citing concerns about obesity, tooth decay and other health concerns. The academy’s other recommendations include limiting children ages 1 to 3 years old to 4 ounces of juice daily or less and kids 4 to 6 years old from 4 to 6 ounces each day. Older kids up to age 18 should not drink more than 8 ounces per day. Many children drink fruit juice. 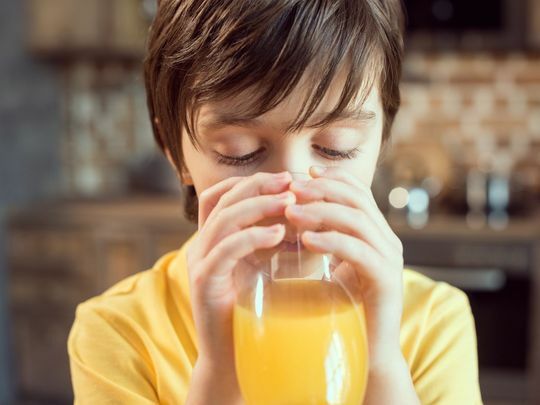 More than 80 percent of parents of children age 3 and younger give their kids fruit juice at least sometimes, a recent Consumer Reports survey of 3,002 parents found. For 74 percent of respondents, kids drink juice at least once a day or more. Apples and grapes are processed with the skin “co-mingling with the inside of the fruit,” which can elevate heavy metal levels, she said. The researchers note that heavy metals can also be harmful to adults. “Five of the juices we tested pose a risk to adults at 4 or more ounces per day, and five others pose a risk at 8 or more ounces,” Dickerson says. Lifetime exposure to “modest amounts of heavy metals,” the researchers say, can increase risk of bladder, lung, and skin cancer; cognitive and reproductive problems, as well as type 2 diabetes. Lead is also linked to high blood pressure, heart disease, and fertility problems, while arsenic is associated with cardiovascular disease. Cadmium can increase the risk of bone damage and kidney disease. Natalie's Shares Their Bloody Mary Recipe with The Press Enterprise: Looking for a New Year's Day hangover cure?